Padded swivel seats, LUND 16' and 14' boats with drop in flat sub-floors offering stability and dry feet! Merc and Yamaha 15's, 20's and 9.9's for dependability. Mojikit Channel - Our banker at the time of purchase said "You just grabbed the brass ring!" 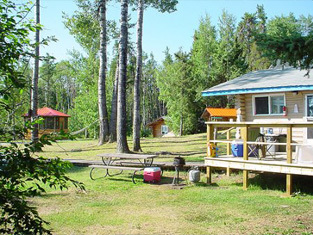 For some of the best Walleye fishing anywhere in Ontario Canada, we top it off with Top Notch Fly-In Outpost Fishing Camps. 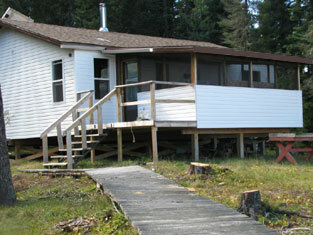 We have 10 deluxe outpost fishing camp locations on 8 lakes in and around Wabakimi Provincial Park. 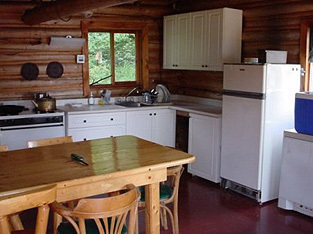 Chipchase is truly a deluxe outpost camp, at almost 900 sq ft, it's wilderness luxury! Chipchase also has a large screened Octagon gazebo. Chipchase Lake is 2 miles long and water depths average 20 ft and at its deepest 50 ft. River access to Grinch Lake makes a great day trip destination. 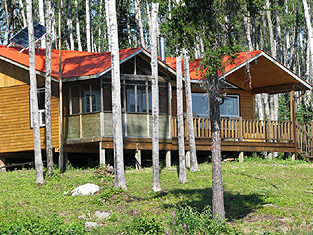 Vacationers to our Grayson Lake Fly-In Outpost Camp are pleasantly surprised by this beautiful vacation retreat spot. Many say - "It feels like a summer cottage " with its ultra large deck and commanding view. 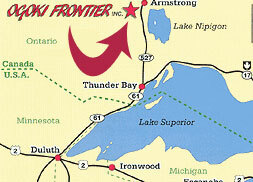 Grayson Lake is 7 miles long with a portage boat into Nikki Lake for added fun excursions. The South camp was newly constructed in 2001. Truly a deluxe outpost camp, it's big, impressive and well thought out. From the 15 foot cathedral ceilings to the stand up bar we designed the camp with the big group in mind. 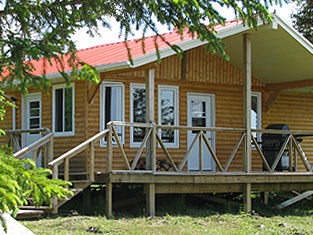 Mojikit Channel North is a beautiful camp which features three private bedrooms. This camp has all the good stuff including thermostatically controlled wood burner along with the standard, hot and cold running water, radio comunications, large freezer, gas grill and one of the best features is the large screened in porch! Two lakes, approximately 7 miles of navigable river, sandy beaches and a large comfy log cabin, all in a private setting with ‘Natures Showroom' on display. Whiteclay Lake is a long 13,000 acre lake with many interesting places to visit and fish. 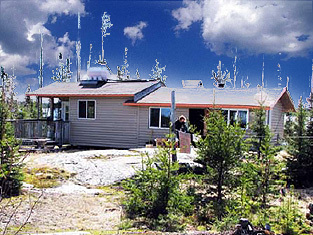 Ogoki Frontier has two camps that are 5 miles apart - above the West camp at the mouth of the Ogoki River. The fishing here is exceptionally good. 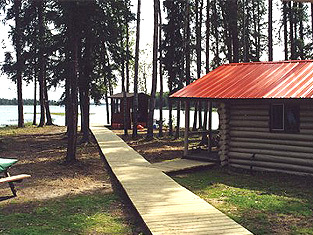 Whiteclay North at the mouth of the Moncrief River is a beautiful spot with a bunk house separated from the main cabin. It's a definite feature for those who like to turn in early while the night owls tell just one more story. Just wanted to drop a quick email to you trying to put into words the great, great time our group had! We were not "over promised or oversold" on anything. As we had ten years of previous Canadian fly in experiences with other outfitters we were concerned about the change in going to your camp. Needless to say we were delighted in every aspect of our weeks stay. Thanks again for your wonderful customer service!! We will be talking soon about next year! Scallop is, in fact, a part of a four small lake series Maddy - Lower Maddy - Austen and Scallop, all part of the Raymond River system. 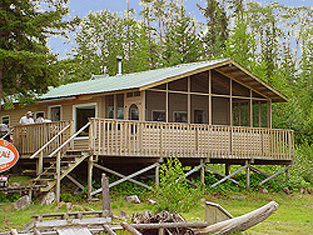 The Scallop cabin has in recent years seen many improvements: Solar electricity, gravity fed water system with hot and cold water, a large added screened in porch, a shower, Screened in fish cleaning house with running water. 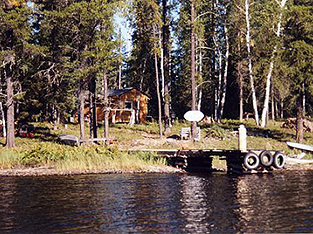 Deluxe Wilderness Outpost Fishing in Northern Ontario - Offering great fishing vacations for 25 years! 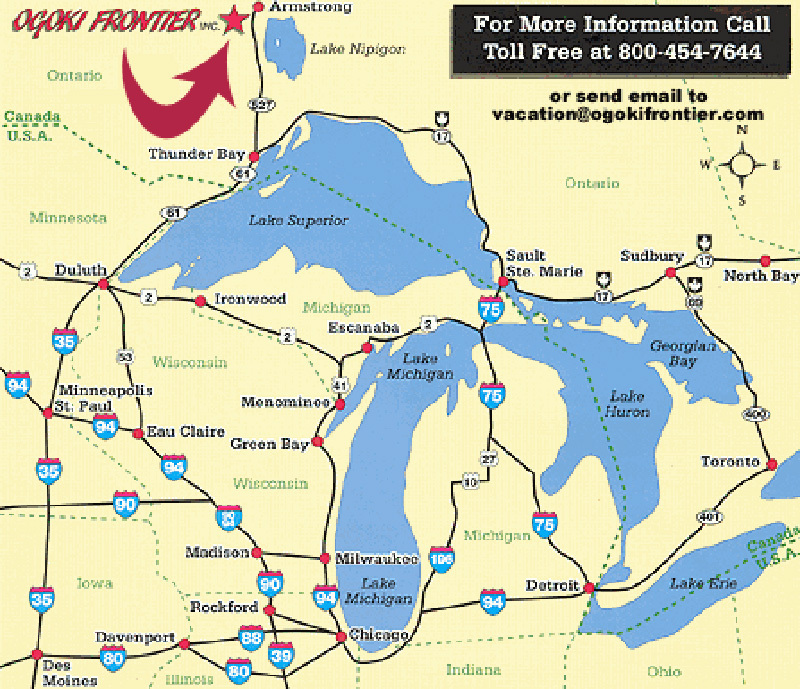 Remote Northwestern Outpost Fishing - First there was the Muskoka's then they tried Algoma Country and now for ane even better more remote fishing experience comes Armstrong Ontario and the Ogoki Frontier. Located up in Canada's Boreal Forrest where the Moose still roam free and the Woodland Caribou can be found.